Comedy clubs across the nation are joining together to raise money for entertainer (and Ottawa native) Mike MacDonald, who was recently diagnosed with hepatitis C and is now waiting for a liver transplant. But of course, comedians won’t let this get them down. The Yuk Yuk’s on Elgin will be celebrating Mike’s birthday this Thursday by putting on a comedy show, with all funds going towards his medical expenses. Thursday, June 21, 8:30 p.m. $20. Yuk Yuk’s, 292 Elgin St., www.yukyuks.com/location.aspx?LocationID=10&PageID=20. Crystal Shawanda takes the stage at the Summer Solstice Aboriginal Arts Festival. Why couldn’t Canadian history have been this fun in high school? National Aboriginal History Month is coming to its end this weekend with a bunch of free events and programs. Musical performances, including one by country singer Crystal Shawanda, dance competitions, and extensive kids’ activities (hello human hamster ball!) will be going on all weekend, free of charge. Thursday, June 21, to Sunday, June 24. Vincent Massey Park, Riverside Dr. and Heron Rd., www.nadottawa.ca. Only in its second year, this festival promises to showcase some of Ottawa’s best musical talent. Organizers want to “bring you back to the years when riding bikes, blowing bubbles, drinking lemonade, and laying in the sun was our daily grind.” Come for the music and stay for the atmosphere. Proceeds go towards a hockey team of youths deemed ineligible to play on other teams. Friday, June 22, to Saturday, June 23, various times. $20. The Clocktower Brew and Pub, 575 Bank St., and Irene’s Pub, 885 Bank St., www.feverfest.ca. Over 40 female business owners from the Ottawa area will be showcasing their products at the Lovely Ladies Small Business Fair this Saturday and Sunday. Locally made clothing, jewellery, art, soap, and much more will be on sale. Guys — there will be plenty of stuff for you too! Saturday, June 23, and Sunday, June 24, 10 a.m. City of Ottawa Archives Building, 100 Tallwood Dr., www.facebook.com/events/222050737907364. A jazz festival with so much more than jazz: musicians of all different backgrounds and genres will be performing at this 11-day event (plus some comedy from Steve Martin while he performs with his bluegrass band on Tuesday). This weekend’s musical line-up includes Grammy-winning sensation Janelle Monáe, who had the hit song “We Are Young” with the band Fun. Thursday, June 21, to Sunday, July 1, various times. Festival pass $175, daily tickets $49. Main Stage at Confederation Park (Laurier Street and Elgin Street), and other locations, www.ottawajazzfestival.com. 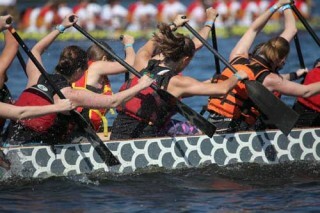 Paddlers give it their all at the Tim Hortons Dragon Boat Festival. This festival at Mooney’s Bay Park is the largest of its kind in North America. More than 200 teams will be competing in corporate, community, and competitive categories. Don’t miss the chance to see Canadian musical acts like David Usher, Said the Whale, Paper Lions, and Spirit of the West perform live, free of charge. A special line-up of performances for kids will make sure everyone’s entertained. Friday, June 22, to Sunday, June 24. Mooney’s Bay Park, www.dragonboat.net. Seafood lovers rejoice! The Whalesbone Oyster House is holding its annual Bytowne OysterFest this weekend, for 11 hours, with four bands, and 6,000 oysters. There will be face painting and balloons for kids (who get in free) and plenty of beer for the grown-ups. Sunday, June 24, noon. $25, includes choice of oysters, fish burger, pulled pork, or vegetarian samosas. The Whalesbone, 504a Kent St., www.thewhalesbone.com.